Even though Polish cuisine has a reputation of being quite meat and potato-heavy, we Poles actually invented a whole bunch of interesting ways of eating vegetables. No meal is complete without them. 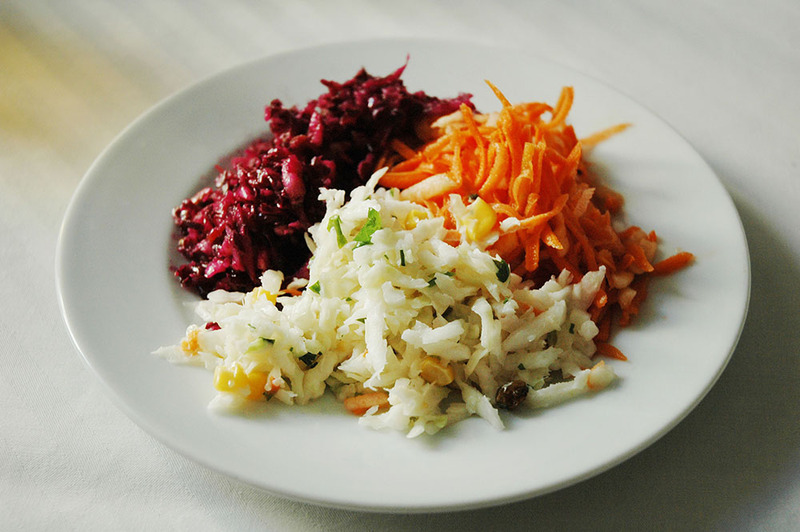 The word surówka is rather easy to decipher – it comes from the adjective surowy which means ‘raw’ and describes a side dish of finely-shredded raw veg, not dissimilar to the famous coleslaw, but with much more variety. You can make it with white or red cabbage, shredded carrots with either apples or horseradish, leeks with apples, or celery root and raisins with a little bit of mayo. Mizeria – thinly sliced cucumbers and cream – as well as sauerkraut and sliced fermented dill pickles with onions are also a popular option. In many Polish restaurants and cafeterias, you can even order a bukiet surówek – a colourful bouquet of slaws that provide us with necessary vitamins and offer relief when served alongside heavier dishes. 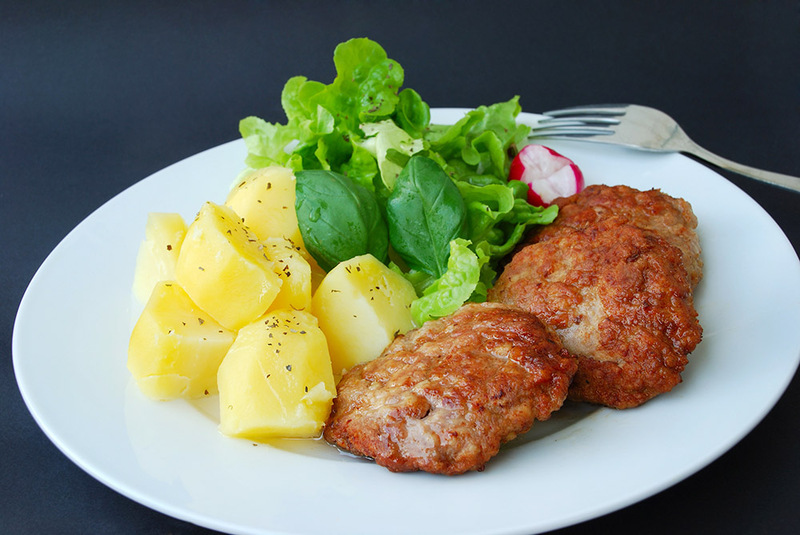 The word sałatka – salad – is used in Polish in a few ways. Since the 1990s, globally-recognised French-style composed salads have become a popular lunch option: chicken, salmon, tuna, eggs or cheese are put on a bed of salad leaves alongside some other vegetables and a dressing. More traditionally Polish are the salads made with cubed ingredients – both cooked and raw – thrown together in a bowl. 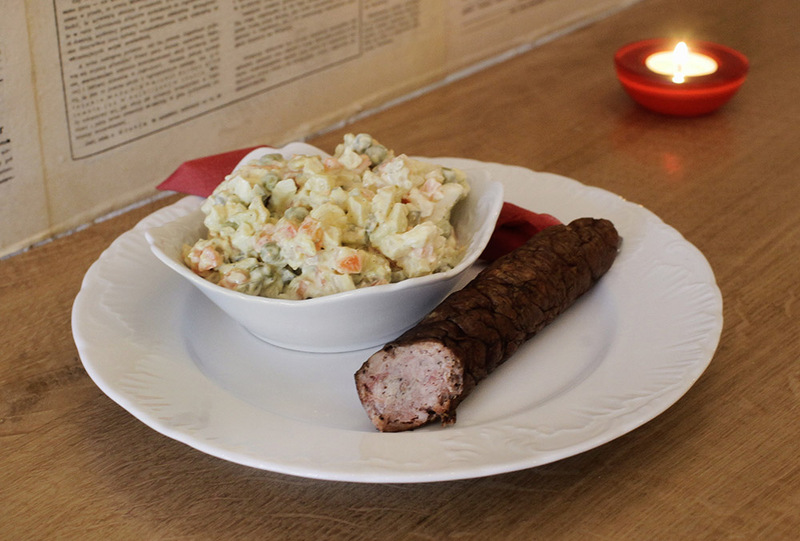 Potato salad, often made with dill pickles and herbs such dill and spring onion, or herring salad with either beetroots or pickled mushrooms are excellent common examples. But note, that we would not use the word sałatka for egg or tuna salad. Concoctions like these that are meant to be spread on bread are called – to add to the confusion – a pasta. Yes, beware that hummus is a pasta in Poland, while spaghetti – not necessarily. That’s a makaron (although recently, we have started using the word pasta for Italian noodles as well on occasion). Yet the queen of Polish salads is, without any doubt, sałatka jarzynowa (‘vegetable salad’), a variation of what is known around the world as ‘Russian salad’ or ‘Olivier salad’ – taking its name from the Belgian chef Lucien Olivier who invented its original version in 19th-century Moscow. But that salad was very different from what is known today. What used to be an extravagant mix of capers, caviar, pickles and grouse was transformed during the communist era into a humble – yet delicious – salad which makes use of vegetables cooked when making broth – carrots, celery and parsley root. In Spain, tuna is added to boiled vegetables, while herring and beets appear in some parts of Russia. The Polish version is almost always vegetarian: we add peas, dill pickles, sometimes cubes of a sour apple and, of course, mayo. We eat it during family celebrations and – well, whenever we make stock actually, because our grandmas taught us not to throw anything away. While the concept of ‘meat and three veg’ is quite popular in a few countries, such as Australia and the USA, in Poland two usually suffice. One veg is standardly potatoes, while the other either a cold surówka, or a warm serving sometimes called jarzynka. Popular choices for this warm option include peas with carrots or beets, all thickened with a roux. But our main contribution to international cuisine when it comes to vegetables is the idea of eating them ‘à la polonaise’. This term, which, according to Larousse Gastronomique, appears in many 19th-century French cookbooks, stands for vegetables cooked au naturel, sprinkled with hard-boiled egg yolks and parsley, and served with a sauce of breadcrumbs browned in butter. While eggs are mostly used with asparagus, toasted breadcrumbs are a popular accompaniment to our favourite seasonal vegetables, such as two eaten all summer long: cauliflower and green beans (or yellow beans, for that matter, since we have both varieties). Served with some new potatoes with butter and dill and a sunny side up egg they make for the perfect summer meal. This concept of seasonality, so prominent at the moment among chefs worldwide, is actually quite inherent to Polish culinary culture. As with berries, at which we throw ourselves in the summer, we also wait all year round for favourite veggies. Asparagus, baby carrots, new potatoes and cabbage are everywhere in spring, while juicy tomatoes, green beans, cauliflowers and chanterelles become mandatory in summer. Pumpkins and a wide variety of wild mushrooms nestle their way into many autumn menus. . But possibly the most anticipated of them all is bób – broad beans. When it makes its first appearance at the market or on fruit vendors’ stalls, we buy huge bags filled with this delicious, bright-green bean. 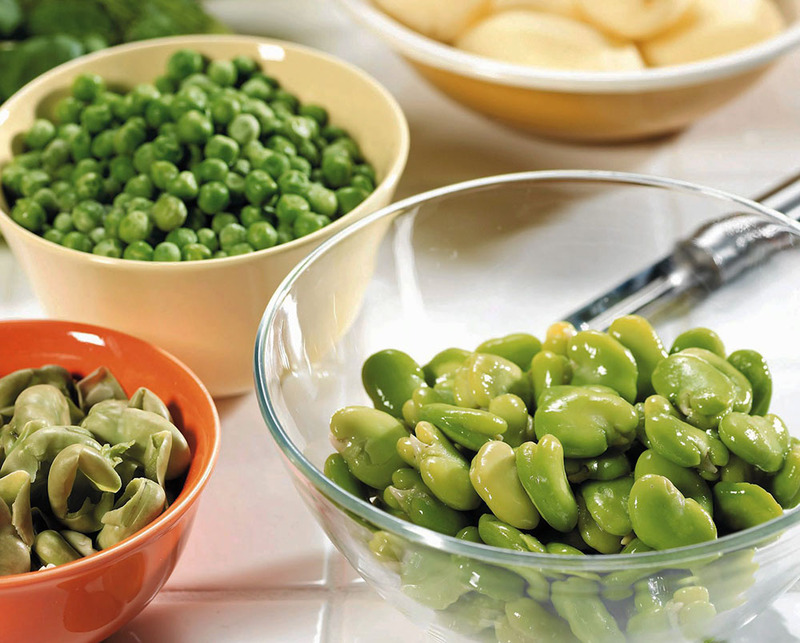 Unlike most seasonal vegetables, we rarely bother using broad beans in actual dishes – we mostly just boil them, season with salt, and then eat them out of a bowl as if it was popcorn. Due to the increasing popularity of veganism and vegetarianism in Poland, traditional Polish meat dishes all seem to be getting plant-based makeovers. Smalec – traditionally a spread of pork fat with onions and apples – has been turned into a ‘Polish-style hummus’ by vegans, who make it using white beans and season it just like the meat version – with lots of fried onions and marjoram. Instead of using meat or liver, delicious vegan pâtés are being made with lentils, different types of beans, as well as celery root, carrots or courgette. These young Polish vegetable lovers are even turning cauliflower or mushrooms into traditional mielone cutlets or making tartare out of chopped sundried tomatoes. 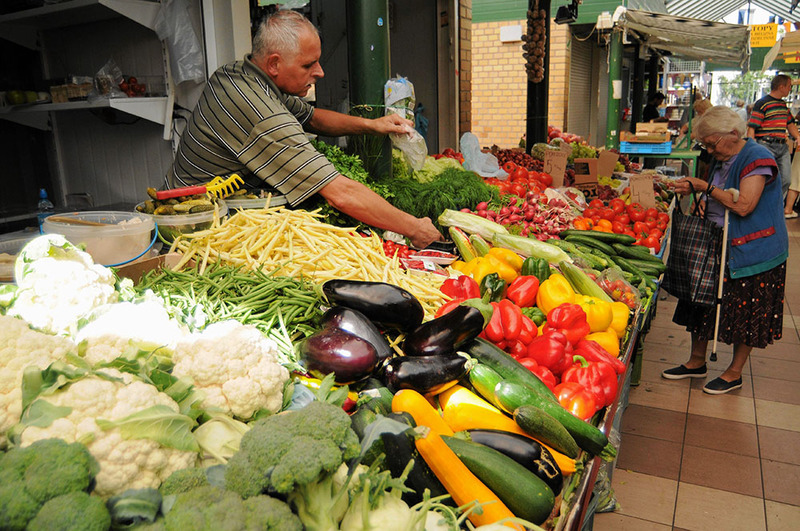 Whether your preferences are traditional or modern, when you take one look at a greengrocer’s stall in the middle of summer, you instantly know that the possibilities of using vegetables in Polish cuisine are endless.